Nairobi (Agenzia Fides) - "We need to clarify the circumstances and reasons of the murder of Fr. John Njoroge Muhia killed on December 10th", said Cardinal Njue, Archbishop of Nairobi, during Fr. 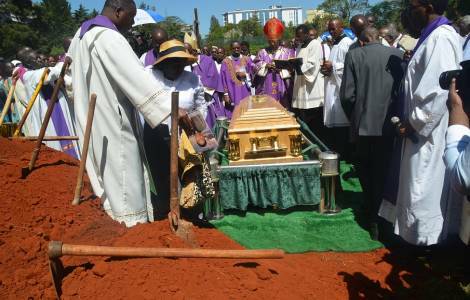 Njoroge’s funeral Mass, in what has been described as a highway robbery (see Fides 11/12/2018). In his homily, the Cardinal hoped that "this whole matter will be handled in a transparent way" also to "give consolation to the family". Turning to the relatives of the murdered priest, Cardinal Njue said "It is not the easiest of situations when you see your son gone, we ask you to remain calm and let us all pray for him. It is not the easiest of occasions - humanly speaking, it is very weighty and painful, particularly when we hear about the circumstances under which Father Njoroge left us". Meanwhile, the president of the clergy of the Archdiocese of Nairobi, Fr. Stephen Mbugua said that the death of the priest was premeditated, well planned and executed by a group of people who were unhappy with his strict administrative nature. Fr. Mbugua revealed that the Late Fr. Njoroge had confided that he was facing challenges from the Church leadership in Kinoo Parish, which made his work difficult. "During some of our monthly meetings as clergy of the Archdiocese of Nairobi, he expressed the difficult moments he was experiencing with his Parish leaders", said Fr. Mbugua. "At one time, he even said he was ready to become a sacrificial lamb, but little did he know it would come that soon. Our brother died a very painful death. One wish and a prayer to God is that he be rewarded with beatific vision. He died serving the people of God diligently", he concluded.